All of our programs are multifaceted and address the three Pillars of Physical Activity, Nutrition and Mentality. Every plan is personally crafted to enable you to achieve your immediate and long-term goals. It is time to get off the merry-go-round of failed diet and exercise programs and make a real, lasting change today. It is time for unprecedented body re-composition, sustainable weight loss, substantial increases in muscle mass, gaining flexibility and mobility, taking control of your pain and reducing your stress, anxiety and depression. It is time to Live your Life, we are here to help! Your personalized plan encompasses all three major Pillars focusing on your current specific needs while helping guide you through the transition that will take you to your desired future goals. We utilize an extensive series of diagnostic tools and collaborate with you to establish your current state. Short term milestones or stepping stones, provide measurable progress you can realistically achieve in 30 days or less. With each success we work with you to evaluate, analyze and adapt your personalized program to achieve your next milestone on your way to lifelong success. Your personalized program is comprised of 3 interwoven Programs: a Mind Program, Physical Program and Nutrition Program. Every personalized program addresses the requisite balance between and within the Three Pillars that is needed for you to achieve your goals. By achieving that balance, you will be able to achieve your goals and then you will have achieved an Optimally Balanced life. Access to our world-class online support tools and mobile app. Photo Food Diary - Forget time consuming food tracking. View your meals and coaching feedback*** from right inside your food diary / photo food diary. Habit Coaching and Tracking - Get incredible results and create long term change with high quality habit coaching and tracking. Up To Date Assessments - Movement screens, body composition analysis, flexibility tests, endurance tests, strength tests, balance tests, and more. Tracking and Measurements - Easy to read charts for instant feedback on everything you track: training results, daily activity, food diary, habit adherence, body circumference measurements, weight, and so much more. Expert Exercise Coaching - Expert tips and personal coaching* to help enjoy the process and help you make adjustments. Automated Notifications - Notifications to remind you of events, nutrition reminders, workouts, mentality exercises and to help keep you motivated. Powerful Messaging Center - Immediately connect by email, SMS, and “in-app messages” to help give you everything you need to guarantee results. Send questions, photos, or any other communication and receive answers, videos, tips, and motivation. Real Time Alerts, Summaries, and Feedback - Client activity pages show you everything you have done. Get notifications and alerts when it is time to complete a check-in, activity and more. Compete in Contests and Challenges. * Optimally Balanced™ does not guarantee the availability classes, groups, lectures or other inventory. Availability may change over time, including during any given membership cycle. The type, quantity, allocation and availability of classes, groups, lectures or other inventory offered are determined by Optimally Balanced™, in its sole discretion. Seating is limited by event and is issued on a first come basis. Optimally Balanced™, at times may reserve spaces and allocate them at its discretion. As such, Optimally Balanced™ can certain steps to release, promote and otherwise make available inventory at varying times and in an ongoing and evolving way. Optimally Balanced™ reserves the right to change from time to time the number of eligible classes, groups or lectures a member can attend per membership cycle, membership plan or otherwise. Please note that eligible classes, groups or lectures not used during a membership cycle are forfeited, and will not be exercisable in the next cycle. ** Membership discounts apply to sale and regular prices only. Membership plans discounts exclude and cannot be applied to any Membership subscription purchases, renewals, upgrades or transfers. In most cases the membership discount cannot be used in conjunction with coupon and/or other special offers, if the membership discount can be used with a coupon or special offer the coupon or special offer will be clearly marked as such. Any coupon or special offer that does not explicitly state that it can be used in addition to the membership discount cannot be used in conjunction with the membership discount. If a coupon or special offer excludes the membership discount, the member will receive the lowest purchase price after applying either: the membership discount, the coupon or special offer. Please contact us if you have any questions regarding the use of a coupon or special offer in conjunction with a membership discount. ***Monitoring and feedback are all services that are provided as part of the Live Coaching service. On occasion an Optimally Balanced™ Coach may review your progress and provide feedback to you, free of charge, even if you are not currently subscribing to Live Coaching. There is no guarantee or explicitly stated offer that you will receive monitoring or feedback and any free monitoring or feedback is done so only at the discretion of Optimally Balanced™. If do not wish to ever have your results reviewed or to receive feedback, please notify customer support or your coach. ****Sample or suggested Meal Plans are provided to all members by request and are included with Live Coaching. Delivered pre-prepared boxes meals are available for purchase, please discuss the pricing and meal type that is most appropriate with your coach or an Optimally Balanced™ representative. Optimally Balanced™ does not directly support or recommend any product or food manufacture and any suggestive plan or prepackaged meal is not to be considered an endorsement or recommendation by Optimally Balanced™. Please see our Terms of Service for more details. Continuous support via email and messaging. 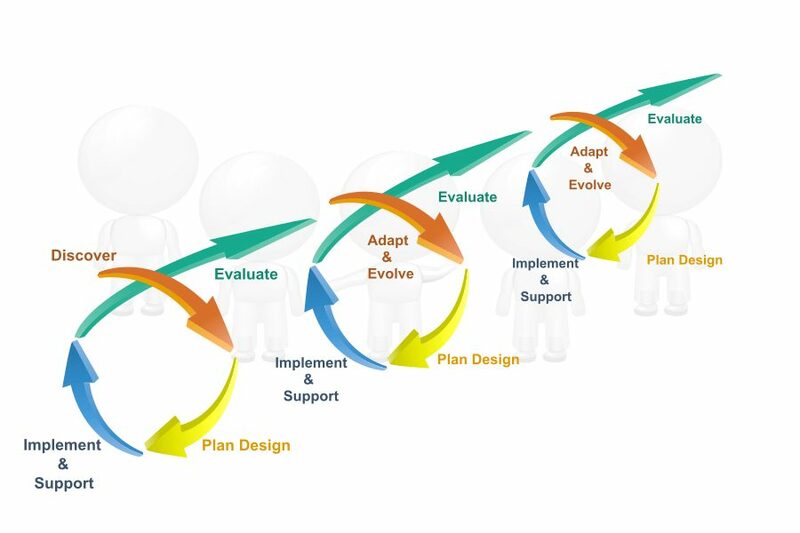 Our process is dynamic, fluid, responsive and agile in its implementation. What this means is simply that we work with you every step of the way evaluating your results, analyzing your progress, and adapting and evolving your personalized Programs. The process begins with the initial discovery period. During the diagnostic phase we work with you to establish your ultimate goal and to establish monthly milestone goals. We also track your current levels of nutrition and fitness and assess different mind aspects such as stress level. The process continues with the development of a personalized plan that is then implemented and supported. Together we track your progress and make adjustments on an ongoing basis. At every milestone we evaluate and modify your personalized plan so that you achieve your goal as seamlessly as possible. Your personalized plans are custom tailored using the F.I.T.T. principles to ensure that your plan and routines will adapt to the intensity and frequency that you can handle.